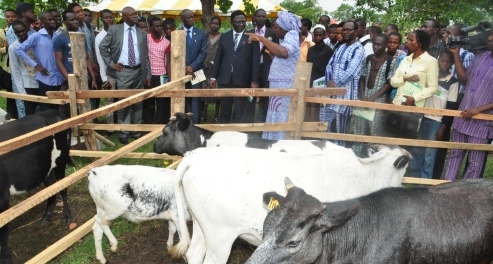 A Professor in the University’s College of Agricultural Management and Rural Development (COLAMRUD) and the Director, Institute of Food Security, Environmental Resources and Agricultural Research (IFSERAR), Professor Akin Omotayo, has challenged academics in the nation’s ivory towers to desist from laying claims to intellectual properties of others, but rather embark on original, result-oriented researches that are capable of engendering development. Delivering a lecture titled, Intellectual Property Rights Protection And How To Avoid The Trap of Plagiarism, at the Third Lecture Series of the College of Agricultural Management and Rural Development, Professor Omotayo condemned the practice by some academics, who are too lazy to carry out genuine researches that would alleviate the sufferings of the masses but preferred to plagiarize other peoples’ works. “Plagiarism, simply put, is stealing or illegally appropriating another man’s intellectual property. It means using another person’s protected work without due permission or authorization”, he said. Professor Omotayo pointed out that plagiarism had become a trap in the country because it has been downplayed so much by academic institutions, as many academics now take many things for granted due to the abundance of materials on the Internet. Describing the act as criminal, the one-time Commissioner in the Ekiti State, Ministry of Agriculture and Natural Resources, Professor Omotayo called for the institutionalizing of Intellectual Property Rights Protection Policy in Nigerian Research Institutes and Universities, particularly in the agricultural sector, to eradicate piracy and plagiarism and to encourage creative, innovative and competitive research. Highlighting ways of avoiding the trap of plagiarism, Professor Omotayo said “writing your ideas as they come in your own language or expression and support or strengthen with corroborated evidence from other people’s work. Academics and lecturers should be careful not to trust their postgraduate students to the extent of not cross-checking their work before using portions of it or appending their stamp of confidence. It is completely unethical to assume lead authorship of a work done by your student”. He commended FUNAAB for using only licensed softwares and recommended that other government agencies and Universities should follow suit and stop using pirated software in their Information and Communication Technology outfits. Professor Omotayo also advocated for the establishment of an Intellectual Protection Office at IFSERAR, to assist scientists and lecturers to process IPR protection and educate staff appropriately, as he advised academics to imbibe the culture of regular publishing, to boost their career rather than publishing for mere promotion. He also called on the University to develop guidelines for undergraduate and postgraduate students to follow when preparing Term Papers and final year projects, in order to avoid IPR protection violations and plagiarism, adding that there is a software called ‘turn-it-in’, which can help determine if a work is plagiarized or not. Speaking on the benefits of the adoption of the IPR protection policy, the Director said it entailed the prevention of piracy and plagiarism of academic works and technological designs, provides an opportunity for investors and owners to define and claim ownership rights, encourage further inventions as scientist are motivated and more focused towards research development. Other advantages include stimulating investments in the commercialization of research products, creating opportunities by attracting international organization for research support and technological development, promoting the culture of originality and professionalism and providing appropriate rewards and incentives for inventors and innovators. 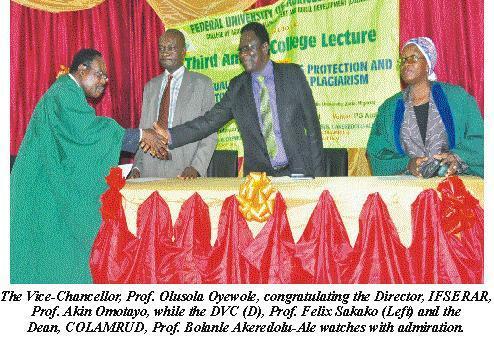 Earlier, the Vice-Chancellor, Professor Olusola Oyewole, disclosed that for some time now, academics in Nigeria had been concerned about the issue of plagiarism in the nation’s ivory towers, adding that FUNAAB had already subscribed to the ‘turn-it-in’ software, to guide against plagiarism. He challenged academics to go back to the academic culture they are known for, when he said “in the past, University academics serve as the conscience of the people, the defenceless and downtrodden and spoke out at important times to direct the nation on where they should go because they were guided by the values of integrity and excellence”. Professor Oyewole noted the fact that the University had a lecture on Intellectual Property Rights Protection was an indication that it is committed to doing things rightly and working towards attaining a world-class status. The Dean of COLAMRUD, Professor (Mrs) Bolanle Akeredolu-Ale giving her remarks, said that the College was committed to leading by example and graduating students based on merit, who would be good ambassadors of the University.